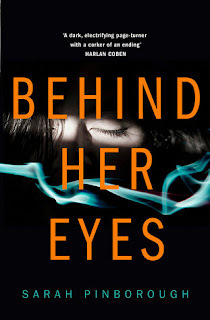 Title: Behind Her EyesAuthor: Sarah PinboroughPublisher: HarperCollinsRelease Date: 26th January 2017Synopsis: Only two can keep a secret if one of them is dead. It’s said that the only people who really know what goes on in a marriage are the couple themselves. But what if even they don’t know the truth? David and Adele seem like the ideal pair. He’s a successful psychiatrist, she is his picture-perfect wife who adores him. But why is he so controlling? And why is she keeping things hidden? Louise, David’s new secretary, is intrigued. But as Louise gets closer to each of them, instead of finding answers she uncovers more puzzling questions. The only thing that is crystal clear is that something in this marriage is very, very wrong. But Louise could never have guessed how wrong things really are and just how far someone might go to hide it. Review: On its basis this isn't a book I would normally read. But the proof I found had sprayed edges and the #WTFthatending tagline made me think twice. I was also a fan of Sarah and all these things together mixed into a winning combination. And overall it was different. It felt different. I felt a lot of emotions when reading this book and was actively being affected as I read venting on the bus, then taking to twitter, then going back and repeating my verbal outbursts all the way through right up to the end. I regularly judge my mother for talking to the TV and then i go and do something like this. There were fresh twists and turns, you just wanted to grab the popcorn sit back and watch it evolve. Normally in a book you root for one side and there's a juxtaposition between the characters, but here you got wrapped up in all three of them. It was this weird triangle that you couldn't help get stuck in. First you're team Louise, then team Adele, then team David! This book exists across multi facets and the within that multi perspectives that lead up to this dramatic ending. Then you ok its done...THEN you get smacked across the face on he last page and there is all this adrenaline that i had to sit and take a moment at the end. As I said you get very drawn into these peoples lives, but what I loved was the extent to which they got involved in each other lives and the weird dependant friendship, nay obsession, that developed between Adele and Louise. Because we saw from both their perspectives and we got the whole story and having all the information gives you the thrill of knowledge when seeing a certain situation. But in true Sarah style this information isn't always what you think it is so you;re constantly playing a game of tennis trying to keep up and piece everything together. I felt this strange affinity to Louise, I was the Louise in this book and I don't know how I feel about that. Though maybe rather be Louise than Adele. And if you ever get a chance to go and hear Sarah talk do it because she's great! From this review it is sure that it seems to be an interesting book to read for every viewer of this website. I am always looking for the suggestion that are meant to be for new books.